Well known rural identity Col Rowland endorses the Aussie Fire Chief as the world’s finest lightweight portable pump for fire fighting. Catastrophic bushfires around the country have destroyed properties and homes. The current combination of hot, dry conditions, dangerous fuel levels and strong winds set the scene for a bushfire disaster. Many residents are still unprepared for a bushfire emergency. The essentials for fire protection are a dependable water resource like a dam, tank or swimming pool, and a reliable fire pump. Australian Company, Aussie Pumps, has developed a unique range of reliable engine drive fire fighting pumps designed for Australian conditions. The Aussie Fire Chief is a simple, robust high performance self-priming pump, available in either single or twin impeller version. It has an efficient pump design that produces pressures of up to 100psi and flows of up to 450 litres a minute. Apart from being used by major Government departments and fire fighting authorities around Australia, the product has been widely accepted in Europe, Africa and in some areas of South East Asia. “We even supplied this superbly engineered product to US customers, who are amazed to find that there is no similar product made in the USA!” said Aussie Pumps chief engineer John Hales. 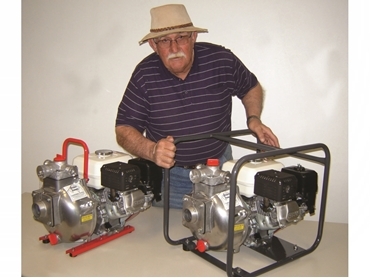 “It is considered the world’s finest lightweight portable pump,” he added. The Fire Chief is powered by a genuine 5.5hp Honda petrol engine but can be supplied with Yanmar or Kubota diesel engines and comes standard with heavy duty steel skids and anti-vibration mounts, designed to provide a firm and secure base for the pump to operate from. This model can be easily transported with a conveniently located carry handle. The heart of the pump is a 7’’ one piece closed style impeller, precisely balanced for maximum performance. The impeller is matched with a heavy duty volute that produces outstanding hydraulic characteristics, the result of years of engineering research and development. Aussie’s fire pump range offer a self-priming feature that ensures the pump primes, first time, every time. The Chief offers a vertical suction lift of up to 7.6 metres, enabling the operator to draw water from wells, streams or dams, a feature critical for fire fighting. “That’s a major feature and can be a matter of life or death, when a fire is on the move,” Hales said. Hales added that a reliable priming feature is of the upmost of importance in any fire situation. “We’ve heard horror stories about third world pumps that simply won’t prime in an emergency!” he said.